While we were done with the County, there were still a few things left to be finished. 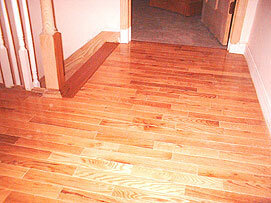 Most important of these was the floor of the upstairs hallway. 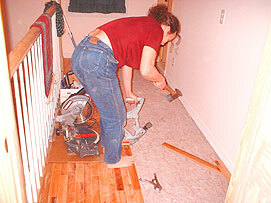 Here’s Elizabeth installing 3/4″, solid oak, tongue-and-groove planks with the special, hand-driven, flooring nail gun. This tool places the appropriate-sized nail into a precise location on the tongue of a board at a 45° angle, allowing it to be nailed securely to the sub floor. You can see from this photo, it turned out very nice. This type of flooring, where the planks come in shorter pieces that are not matched, is much cheaper than the lengths of selected oak, still looks lovely and gives a rich and substantial feel to the hallway. It was a happy coincidence that this upgrade brought the level of the floor up to coincide with the height of the “zero” step at the top of the stairs, too, making a very neat transition. Once the landing floor was taken care of, the house was fully functional, so Elizabeth turned her attention to fiddly things, such as the tile around the tub. 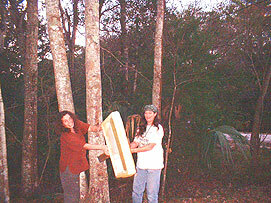 Here Elizabeth is holding a tile while the thinset mortar “sets” a little to give it enough “grab” to hold it in place. Note the rubber ducky in the background, all ready for her first dip in the water. 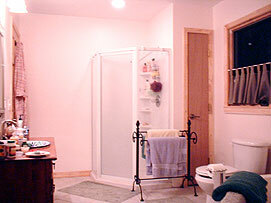 Here’s the finished bathroom from the bedroom doorway. 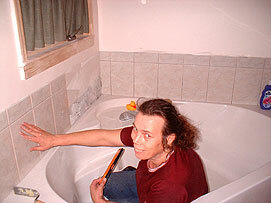 Elizabeth spent a day building the shower and a frustrating couple of hours fitting the tiny linen closet door. We picked up the quilt rack for a song – it makes a great towel holder. Note the cafe-style curtains. These give us bathroom privacy yet we can still see the trees around us. The fiddly jobs done – or put off until later – we noticed that the “builder’s box”, where the plans and permitting papers were kept for the building process, was still up on a tree near the entrance. So – we had a little tear-down ceremony and a friend took a photo of us throwing the box to the floor. 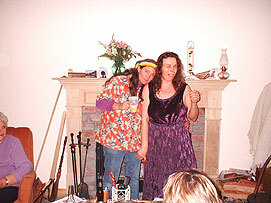 So, of course, the next thing to do was throw a big house warming party, which was on Superbowl Sunday the 26h January, 2003. 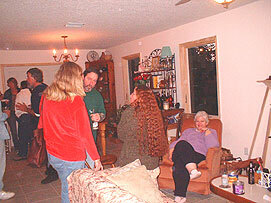 We made it an open house from 11AM to 11PM and about 60 people showed up throughout the day. Here’s Barbie’s happy mom, Joy, sitting surveying the scene and friends Donna and Harry, who also installed the kitchen cabinets. Check Donna’s gorgeous hair! Everyone was absolutely blown away that we had built a house under our own guidance and responsibility and were amazed at how beautifully realized it is. 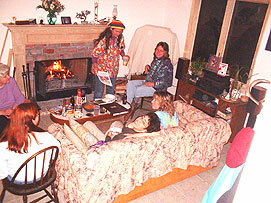 Here’s a bunch of folks, including Barbie, enjoying the fire, this cold winter’s night. This shot was taken from the second step of our stairs. In case you’re wondering, that weird expression on Elizabeth’s face is what passes for a wink at her skill level, and that’s an invisible glass in her hand. The first person we invited to our house warming was Steve Tuma, of Landmark, who oversaw our project from thousands of miles away with great aplomb, keen understanding and great experience. Unfortunately, it was his birthday and an inconvenient time to visit (we’re still waiting to see a photo of him, even). If he had been there, we would have appreciated him mightily for delivering on his pledge that our house would be built quickly and built well. His advice all through the intense months of decisions and work-arounds that were vital to the integrity of the house, he kept us sane and on-track. If we wanted to upgrade something and were scared we would go too far, Steve always had a level-headed approach to figuring it out and we’re sure we made all the right decisions as a consequence. The only thing we didn’t do that he strongly suggested was have rain gutter fitted as part of the building process. A couple of months later, after a series of heavy rain storms that left grooves in our yard, we had our guys back to install the gutter, as Steve had suggested, giving him a 100% record of good advice. We are writing this on March 17th, 2003, and, not surprisingly, Landmark have come to adore this now immense presentation of our house-build so much, they want to incorporate it in their web site. We agreed immediately. They also asked us to include a few words about our financing. Like a lot of people who come to Landmark for help in building their home, we were not the standard, ideal financial package for a bank to give a mortgage to and were sceptical that we would be accepted. However, once our project was fully cleared as viable and we were pre-qualified, Steve and his wonderful team of financial people had us set up for a construction loan and mortgage package that was so favorable to us, our mortgage broker friends could not believe it. In addition, the only out-of-pocket expenses we incured was the $1000 down for Landmark expenses. One broker friend came with us to both closings (construction loan and mortgage) to make sure everything was above board and came away so impressed she wanted to work with them. To sum up, if we had known how intense and often overwhelming this process was going to be, we would have thought, not twice, but ten times before committing to it and if you are considering doing something like this – particularly if you take the role of “general contractor and site manager” – we strongly advise you to do the same. You need a lot of willpower, a decisive nature and a core of inner strength to do this, as well as a knack for organizing. However, if you feel you can bring these qualities to your project, we recommend you look into it further – and we can absolutely vouch for Landmark and every aspect of their part in the building of our beautiful new home – Harmony House. If you have a viable dream, and the determination to carry it through – and are aware of what it will entail or are prepared to become aware before you begin – we say …go for it! We emerged from it all shaken but not stirred, and with new skills, new vistas and the priceless awareness that we took on one the most massive projects people are likely to contemplate and pulled it off.